Bristol balloonist Don Cameron has been diagnosed with cancer. 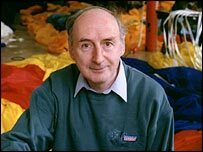 The 68-year-old is the founder of balloon makers Cameron Balloons, and is closely associated with the world-famous Bristol Balloon Fiesta. His spokesman said a tumour in Mr Cameron's mouth has been successfully removed but he now faces chemotherapy. Mr Cameron said: "The facts are that my cancer is less frightening than first feared. It has been diagnosed as Hodgkin's Lymphoma." He added: "I am told that this responds very well to chemotherapy and the consultant has said he thinks there is an 80% chance of eradicating it completely. "Although that is still more dangerous than Russian Roulette, it is better than I had feared. "Failing complete eradication, it can be controlled for a long time. "For the immediate future, I will have four months of discomfort and be able to work only some days, but after that it should be OK in the medium term at least." Alan Noble has been appointed Managing Director of Cameron Balloons in the interim.